Wanderers RFC V SCC RFC 30-Jan-2016 from Micheal Johnston on Vimeo. 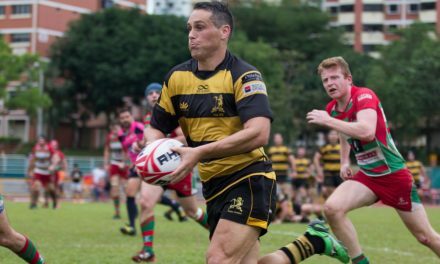 30th April at Yio Chu Kang Stadium will see the clash of the titans as Wanderers and the SCC Rugby Section face each other in not one but both finals on offer this weekend. The World First Challenge Cup Finals will pit the Wanderers 2XV up against the SCC Tankards. The SCC Tankards have already done the double pre-Christmas, and are looking to exact revenge over their defeat to Wanderers in the group stages. The SCC Tankards are coming off a decisive win in their semi-finals, and should not be taken lightly. Wanderers’ high tempo fluid attacking style of play will look to outrun them as they did less than a month ago. Wanderers 1st XV, the reigning World First Premiership champions are the clear favourites as having triumphed over SCC twice in the preliminary stages. The SCC 1st XV will be looking to earn their first premiership title in 20 years and will stop at nothing to have their hands on the cup. With a number of national players on show on both sides, expect the high tempo play of the Wanderers to come up against the rumble and bash of the SCC forwards. With a wealth of talent such as Tom Child and Damien Hoo in their backline, and the likes of the evergreen Matt “Rhino” Roberts and Alvin Ho in the pack, it is hard to pick just one player to watch. Damien Hoo has certainly been the form player of the tournament, so expect him to unlock a dangerous Wanderers backline which will run amok if given the space. Michael Oliver from SCC has been another form player at scrumhalf this season, with the former USA Under 20 Captain dictating the likes of Simon Etheridge and Gabriel Lee in the pack with stunning results. Watch for Oliver and Ben Turner to try and turn the screws on from hopefully some great ball from the forwards.